This kit gives you everything you need to add a second level to your 3pi robot. In this version, the LCD pins are brought up to the expansion board from the base via extended headers for your own custom use. 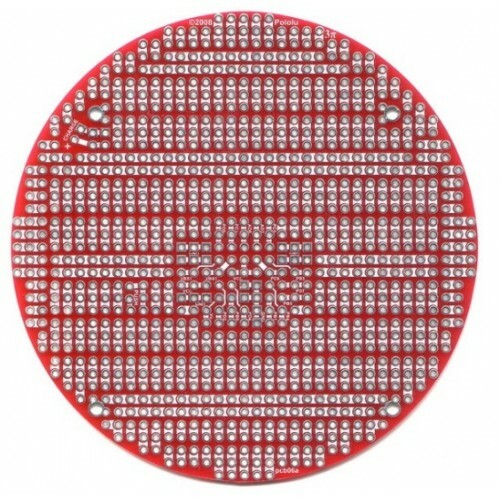 This red printed circuit board can also serve as a general-purpose round prototyping board. 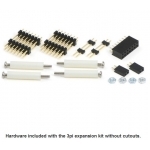 This kit includes a round printed circuit board (PCB) with holes spaced on a 0.100" grid, two extended 2×7 male headers, two extended 1×2 male headers, one 2×7 female header, two 1×2 female headers, four 7/8" nylon spacers, four 1-1/4" screws, and four nuts. 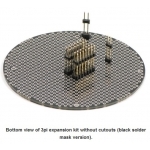 The expansion PCB matches the diameter of the 3pi chassis and mounts just above the tops of the wheels using the four included screws and spacers. 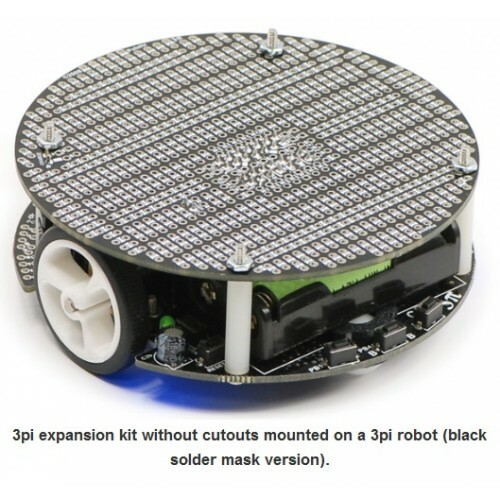 Once assembled, the PCB has electrical connections to the base that allow you interface your own electronics with the 3pi robot, which is sold separately. 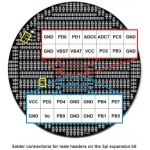 These connections give you access to the ATmega’s LCD pins, ISP programming pins, and free/jumpered pins, as well as to the three on-board voltages: VBAT (battery voltage), VCC (regulated 5 V), and VBST (regulated 9.25 V that is supplied to the motors). Additionally, the expansion PCB connects to the base’s power button and battery charge port, allowing you to add your own power buttons and charge ports. 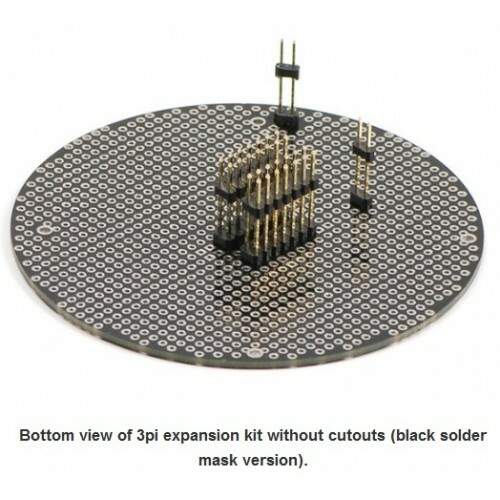 Note: This expansion kit replaces the 3pi’s LCD. 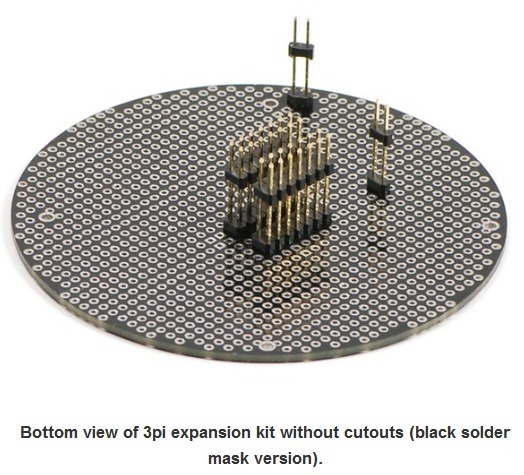 If you want to preserve the LCD, please consider the more advanced m3pi expansion kit. 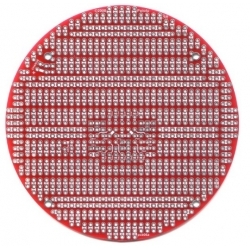 The expansion PCB is designed to provide plenty of prototyping space for your components. It has room for two 0.6" 40-pin DIP (dual in-line package) components, such as the ATmega32 in the picture below, or for numerous smaller DIP components. The prototyping space extends all the way to the edge of the PCB, allowing you convenient points to mount a variety of sensors such as bumper switches and range-finders. The silkscreen shows how the pads are connected; the electrical connections are on the bottom side. You can cut the copper traces on that bottom side (with a sharp knife or a small rotary tool cutoff wheel) if some of the pre-made connections interfere with your desired layout. 2) Insert the long ends of one 2×7 and one 2×1 extended male header into these female headers, and insert an extended 2×1 male header into the battery charge port. Lastly, remove the LCD and insert an extended 2×7 male header into the LCD port. Place the expansion PCB so the tops of these male headers seat in the proper places, as marked by the rectangles in the picture below. 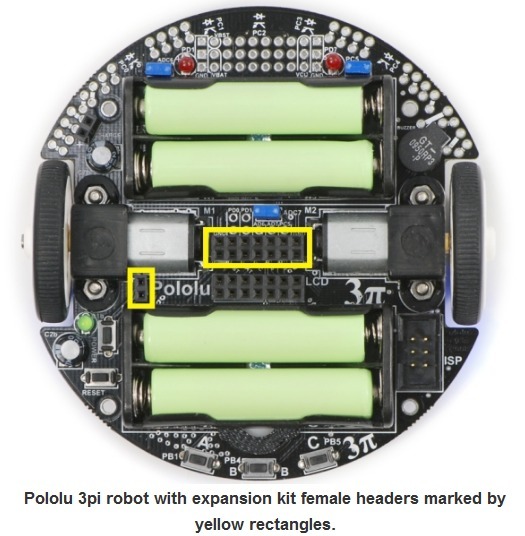 Note that the expansion PCB mounts with the silkscreen facing up.